In January 2017, Global MINDS launched a new transdisciplinary graduate seminar course, “Global Mental Health System Innovation” at Western University, through the MMASc in Global Health Systems program. This community-based experiential course joins student teams with community partners to create a disruptive soolution to a complex mental health system challenge proposed by a community partner. In 2017, the students partnered with organizations in London, Ontario, Canada. In 2019, the students partnered with community initaitive in Machakos, Kenya. Students engage in our Social Innovation System Cycle, and in tandem, participate in targeted sessions and assessments aimed at developing system leadership and professional capacity (e.g. pitching, cultural humility, and collective impact). In addition, students engage in regular mindfulness practice to foster both: an intentional practice of embracing uncertainty, and understanding failure for growth; and compassion and authenticity, including a profound acceptance of, and connection to, the self, team and community. Ultimately students will recognize their potential as a dynamic agent in a diverse global community, while acknowledging, challenging and changing the limitations of their own worldviews. 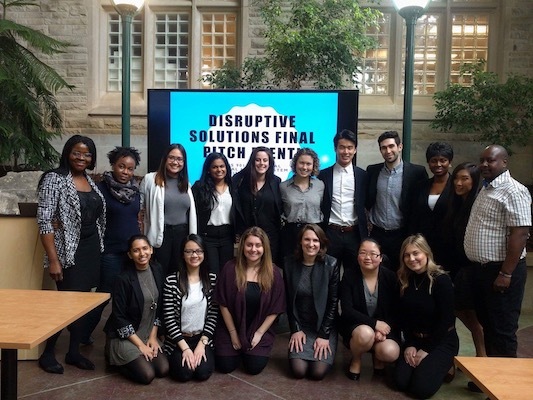 The course concludes with a Disruptive Solutions Final Pitch Event, where student teams "pitch" their final solution for their community partner’s complex challenge to an audience of over 50 individuals from Western University and the London community!